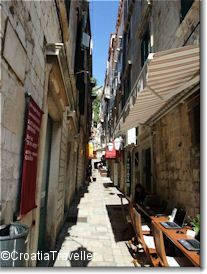 Old stones, steep streets and curving hills make up greater Dubrovnik's terrain. Walking out to Lapad or Babin Kuk is long and not particularly pleasant but foot power remains the best way to see the Old Town. Read more. The public transport system in Dubrovnik consists of a rapid and efficient network of buses that can take you from the Old Town to the port, Lapad, Babin Kuk and even down to Cavtat in no time. Read more. It's not hard to find a taxi to whisk you around town and to the airport. Read more. Uber is available in Dubrovnik but only from June to October. Nevertheless, it offers a substantial savings over taxis. Read more. What could be more pleasant than getting around Dubrovnik by boat? Routes are limited and summer only but it's fast, frequent and free. Read more. A car is most convenient if you'd like to get out and see a bit of the coast but it's not really necessary to see Dubrovnik's sights especially as the historic center is pedestrian only and parking is a hassle. I recommend using the local bus system and renting a car only for trips out of town. Read more. Or, you could dare to be different and try renting a motorcycle or scooter. Why not book ahead with BikesBooking.com?